Hezbollah launched a major offensive in support of the Assad regime yesterday, with fighters from the Lebanese militant group playing their most significant role yet in Syria’s two-year-old civil war. Opposition activists claim Hezbollah fighters, who were supporting regular Syrian troops, stormed the rebel-held town of Qusair, only six miles from the Lebanese border. They fired multiple mortar rounds and launched rocket-propelled grenades in an attack that witnesses say killed at least 32 people. An opposition activist, Hadi Abdallah, told the Reuters news agency that Syrian warplanes had bombed Qusair in the morning, while artillery shells were hitting the town at a rate of up to 50 a minute. “The army is hitting Qusair with tanks and artillery from the north and east while Hezbollah is firing mortar rounds and multiple rocket launchers from the south and west,” he said. “Most of the dead are civilians killed by the shelling.” Qusair is a strategically important town because it allows those holding it to control the coastal road. Its proximity to the Lebanese border also allows the regular Syrian army to link directly with Hezbollah. Reports suggest the town has been besieged by Syrian troops for weeks. Syrian television said the army was “leading an operation against terrorists in Qusair”, with troops reaching the town’s centre. “Our heroic forces are advancing toward Qusair and are chasing the remnants of the terrorists and have hoisted the Syrian flag on the municipality building,” the report said. “In the next few hours we will give you joyous news.” Reports suggested that as many as eight Hezbollah fighters had been killed in the operation. 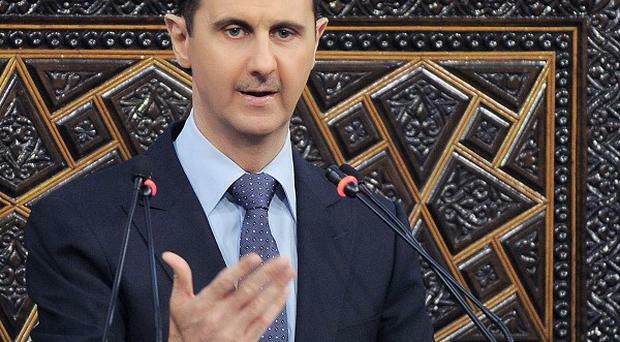 The group’s ever greater role in supporting the Assad regime will be worrying news in Israel. Benjamin Netanyahu used a cabinet meeting to warn that Israel is prepared to launch further raids against Syria if it believes the desperate civil war on its northern border threatens to spill over. Israel and Hezbollah fought a six-week-long war in 2006. Although not formally acknowledged by the Israeli government, the Jewish state launched at least three attacks on sites near Damascus two weeks ago. Mr Netanyahu’s administration has consistently said that it will act to prevent groups such as Hezbollah getting their hands on the advanced weapons known to be held by the Syrians and turning them on Israeli cities. Mr Netanyahu’s comments came as Russia deployed 12 warships to the Mediterranean, in a move that has been interpreted as an aggressive act meant as a warning to Israel and Western countries against any further military intervention in the Syrian conflict. Russia maintains a naval base in Syria at Tartus and has provided weaponry to the Assad regime. The deployment of warships comes days after Russia said it would supply Syria with a number of Yakhont anti-ship cruise missiles, which have a range of 200 miles.